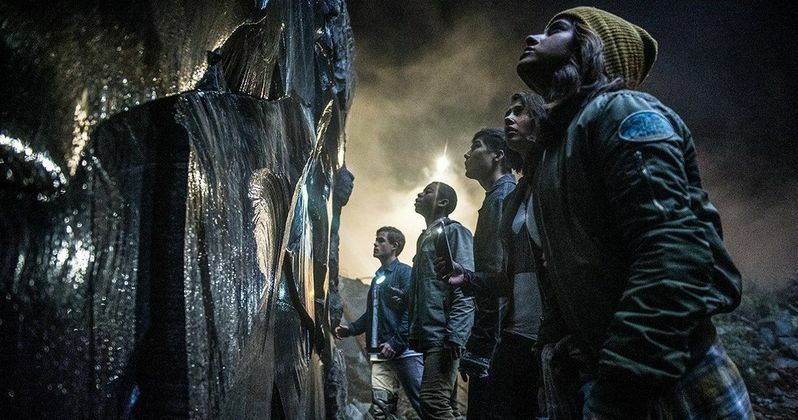 The newly rebooted Power Rangers are heading to the big screen next year and Lionsgate has just unleashed the very first trailer for the new take on the teens turned heroes. While we have been getting a fairly steady stream of official images and promotional material, this is our first look at actual footage from the highly anticipated reboot. While there are a lot of familiar elements present, it is very clear that this is a very different version of the Power Rangers. Lionsgate announced a couple of weeks ago that they would be bringing Power Rangers to New York Comic Con, and they did not disappoint. The panel included many members of the cast and crew for the upcoming movie, but it was the footage that really took everyone by storm. Lucky for us, the studio didn't make us wait too long to reveal the Power Rangers trailer to the rest of the world. While this new movie appears to be a pretty massive departure and update from the Mighty Morphin Power Rangers of the 90s, it is very clear that the producers of the movie are keeping many of the elements that fans loved about the show. The suits did get an Iron-Man-esque redesign, but they did retain their color and flair. The movie will also include the giant robotic Zords and many of the classic characters, even if they are updated for the modern age. There has been talk of a Power Rangers reboot of some kind of quite some time, but with this trailer, fans can rest assured that it is definitely happening and that they can see it sooner rather than later. Not only is the movie going to feature a pretty hefty redesign of the classic Power Rangers look, but it also features a pretty impressive cast. The Power Rangers themselves are being played by promising up-and-comers. The movie features RJ Cyler as the Blue Ranger, Darce Montgomery as the Red Ranger, Naomi Scott as the Pink Ranger, Ludi Lin as the Black Ranger and Becky G as the Yellow Ranger. The supporting cast is sure to inspire confidence in fans, as it includes Elizabeth Banks as Rita Repulsa, Bill Hader as the voice of Alpha 5 and Bryan Cranston, who did some voice work on the original Mighty Morphin Power Rangers show, will be playing Zordon in this new version. Hollywood is currently very obsessed with remakes and reboots, but with the right combination of nostalgia and reworking, this could be something that fans really respond to when it is released next year. Power Rangers is being directed by Dean Israelite and is set for release on March 24, 2017. Be sure to check out the first trailer for the movie for yourself below.